Officials from Dubai’s Department of Economic Development (DED) seized “laser-pointer items” being sold at one or more local markets, according to the newspaper Emirat Alyoum. The lasers were among items such as lighters shaped as pistols and inflatable toys said to be a threat to security and to health. 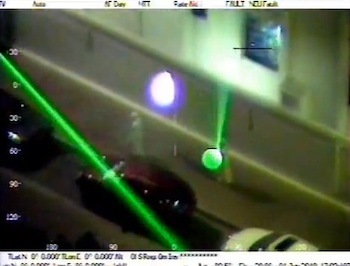 The laser could cause burns to the body and “is prohibited trading in general, affecting the navigational systems for aircraft”, according to a DED director. He warned dealers against importing or marketing such items, saying violators could be fined and even shut down if they are caught again. The newspaper report did not have specifics about the lasers’ numbers, power, color, etc. From Emirat Alyoum. English-language reports from Emirates 24/7 and Bikya Masr.